I'm located at 118 E Ridgeview Dr., Bloomington, Indiana. Can (or should) all wood boats be restored? No. Not if the boat has no value. Value can be measured in terms of a dollars, historical value or sentimental value. It's often difficult to decide whether to restore a badly neglected family heirloom that has great sentimental value or to allow it to decay into dust, thus forever wearing the label as the family member that "ruined" granddad's prized canoe! When is repair really restoration? Restoration is really repairing the whole boat. Usually the boat being restored is stripped down to the bare elements and every defect noted. During this "survey" phase it is most important to find every weak rib, cracked plank or rotten stem. It is critical for the long term benefit of the boat that all necessary problems be resolved. 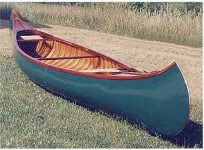 One of the wonderful things about wood canvas canoes is their longevity. Depending on how much you use and how you use your boat the canvas will last 10 to 20 years, maybe more. When the canvas begins to fail and is no longer serviceable it's time to recanvas. The outwales, external keel and stem bands are removed and the canoe is 'skinned'. Any repairs can be make and a new canvas can be installed. After the canvas is 'filled' to waterproof the canvas and make it durable, it is painted and everything reinstalled. Hence, a brand new boat take is good for another generation! You can't do that with a modern canoe! There are some situations where it is simply not partical to restore a boat, yet you don't want to see a boat go into the trash dumpster. The obvious solution is to sell the boat. A good place to advertise is the Wooden Canoe Heritage Association Forum, your local newspaper's classified section, or Craig's List. If you are desperate, give me a call, I hate to see any boat go to the landfill. Q: I have an old canoe my great uncle had for years. He passed away and we are trying to figure out what to do with it. Any suggestions? A: You need to find someone that really WANTS the boat. It would be wonderful if this person is a family member. A person who really WANTS the boat will probably have the desire and resources to care for the boat, restore the boat if needed and most importantly--USE the boat. A boat that is not used is a relic. If no one in the family wants the boat, then look elsewhere. It's more import that the boat is WANTED than whom it is that wants it. See RESCUE above. Q: How much is the typical restoration? A: Average...... $3,000-4,000. This is for a total restoration- skin the boat, strip the interior varnish, bleach the interior, repair ribs, repair blanking, sand the hull, repair the stems, oil the hull, canvas the hull, sand the interior, varnish the interior (4-6 times), paint the hull (3 times), repair the gunwales, sand the gunwales, reinstall the gunwales, varnish the gunwales, do the same thing to the external keel, reinstall the stem bands, re-cane the seats (after striping, sanding, and varnishing...), then those countless little 'futzings' I do until the owner comes to pick her up. Of course, some boats are in real good shape and only need a new canvas and cleaned up. Q: If I buy an old boat at like an auction and have you restore it, how much could I sell it for? A: Let's say you buy a boat for $500, put $3000 into the restoration you could expect to sell it for $1500 to maybe $2500 for a typical Old Town Otca model. If you find a very rare boat.... maybe more if you find the right buyer. 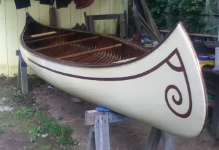 This is why the true 'value' of a wood canvas canoe is usually sentimental. Q: Is it possible to restore my own boat?